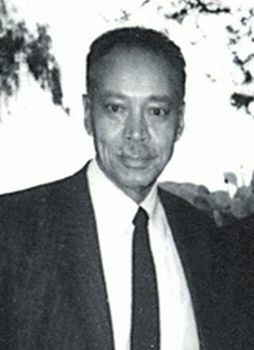 Civil rights activist George Long entered the University of New Mexico with the goal of becoming a teacher, but his involvement in the boycott of a local restaurant and nightclub led to a career in law. He became the first black graduate of the University of New Mexico School of Law and co-wrote the Albuquerque Civil Rights Ordinance of 1952. Born in Alabama, George Long was encouraged to attend the University of New Mexico when he met Albuquerque native Ernie Pyle while serving in Okinawa during World War II. Pyle encouraged Long, then a second lieutenant in the U.S. Army, to enroll in the University of New Mexico after the war. When Pyle was killed in Okinawa, Long decided to move to New Mexico. In 1946 Long enrolled in the university studying political science and geology. He also was active in the school’s music and theater programs. When the glee club went to Oklahoma Joes, a popular restaurant near campus, Long was denied service because of his race. Long left quietly but word spread around campus and a large group of students organized a university-wide referendum to boycott Oklahoma Joes. The referendum passed and the boycott ensued forcing Oklahoma Joes to end its policy of black exclusion. Three months later the students boycotted a Walgreen’s drugstore for similar discriminatory policies. Both incidences were more than a decade before the famous lunch counter sit-ins of the early 1960s. Such widespread student support for this direct action campaign led to the establishment of the first University of New Mexico National Association for the Advancement of Colored People (NAACP) chapter with Herbert Wright as president. In 1947 Long combined his last undergraduate year with graduate school when he enrolled in the university’s new law school. He became its first African American graduate in 1952. While still a student, Long partnered with Wright to draft Albuquerque’s first civil rights ordinance, based on a similar ordinance from Portland, Oregon. With the support of the NAACP and religious groups, the Albuquerque ordinance passed, prohibiting discrimination in public places on the basis of race, original ancestry, religion and color. Violators of the ordinance could be fined $300 or placed in the city jail. The New Mexico state legislature by 1955 passed a similar anti-discrimination ordinance, predating the U.S. Civil Rights Act of 1964 by nine years. When Long graduated in 1952 he moved to Oakland, California and worked as a state insurance investigator and county welfare fraud prosecutor. He went into private practice in 1964 in probate, trusts, and real estate law for several more decades. He died in Oakland in 2010. Quintard Taylor, In Search of the Racial Frontier: African Americans in the American West, 1528-1990 (New York: W.W. Norton, 1998); Nancy Herbert, ed., 60 for 60: Shaping Law in New Mexico Since 1950 (Albuquerque: University of New Mexico School of Law, 2010); “George Long (’52), First Black Graduate, Dies in California,” University of New Mexico School of Law website, http://lawschool.unm.edu/alumni/memoriam/long.php; “The Civil Rights Era in Albuquerque,” City of Albuquerque website, http://www.cabq.gov/humanrights/public-information-and-education/diversity-booklets/black-heritage-in-new-mexico/the-civil-rights-era-in-albuquerque.